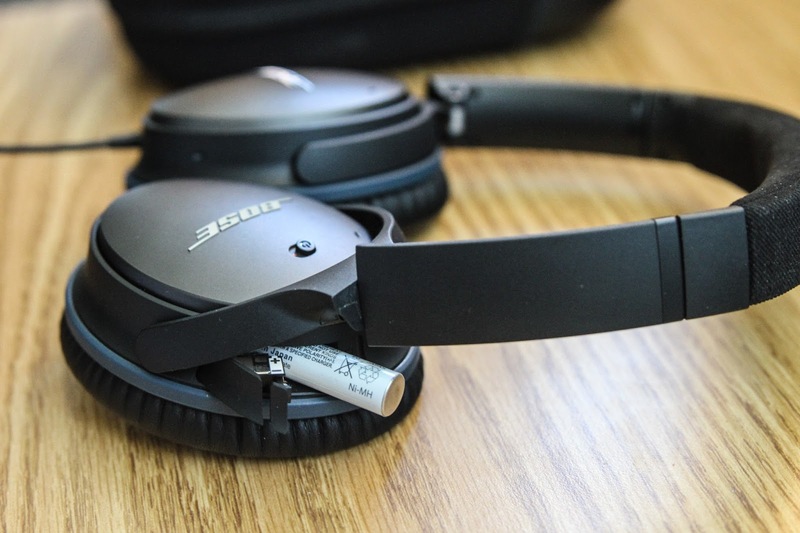 Superzuri: Bose QuietComfort 25 Review. 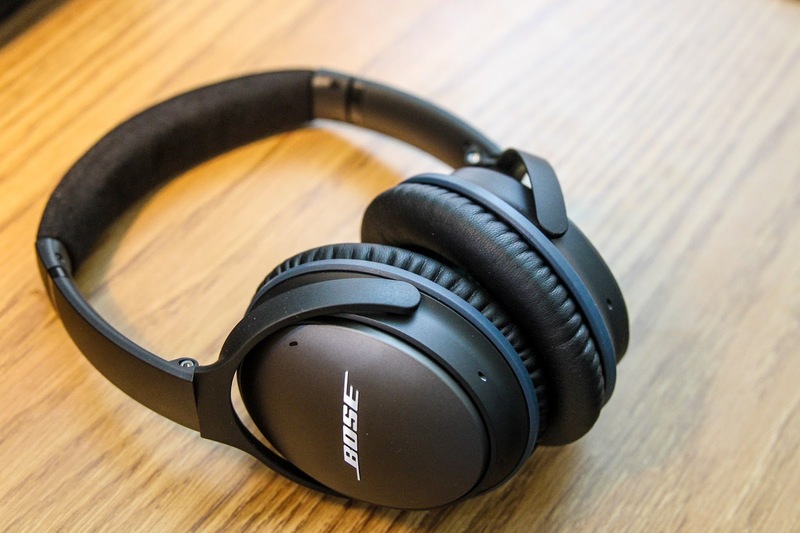 Today I’m going to talk about the experience of the last month with my latest acquisition: Bose QuietConform 25 headphones. During the last 5 years I’ve been using the Technics RP-DJ1200 headphones, with a high rate of satisfaction, except for the noise. When I had to study in noisy places I used Howard Leight isolating headphones with an average attenuation of 27dB. Here is the detailed chart, with the attenuation depending on the frequency. They do a great job but they just isolate. No music. As I spend quite a lot time in the library and it’s not silent at all I thought about buying isolating music headphones. After all, listening an average of 5 hours a day of music it worth to invest in something decent. The benefit is clear: protection for your ears. More isolation and lower volume of music. 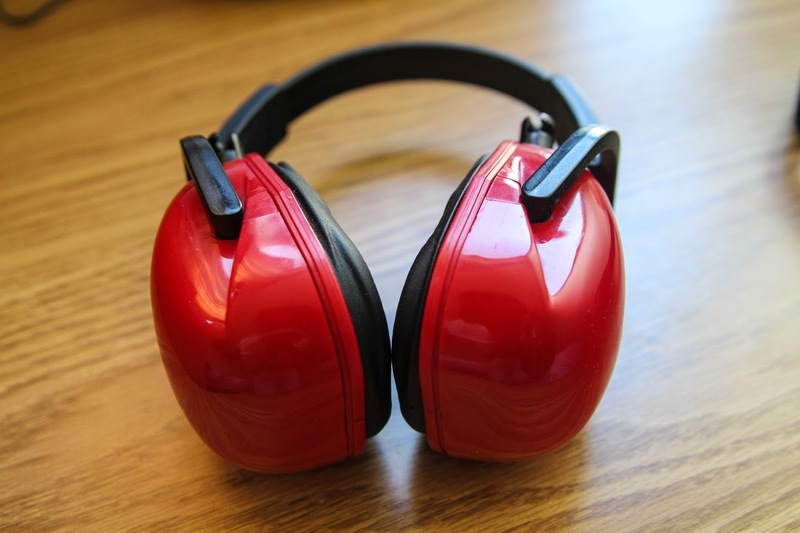 So, when I finally decided it was time to start the hunt I found the first question: Active or passive noise cancelling? I found interesting options in both of the sides, but I was really curious about how good the active were. So I went to a Best Buy and tried them on. 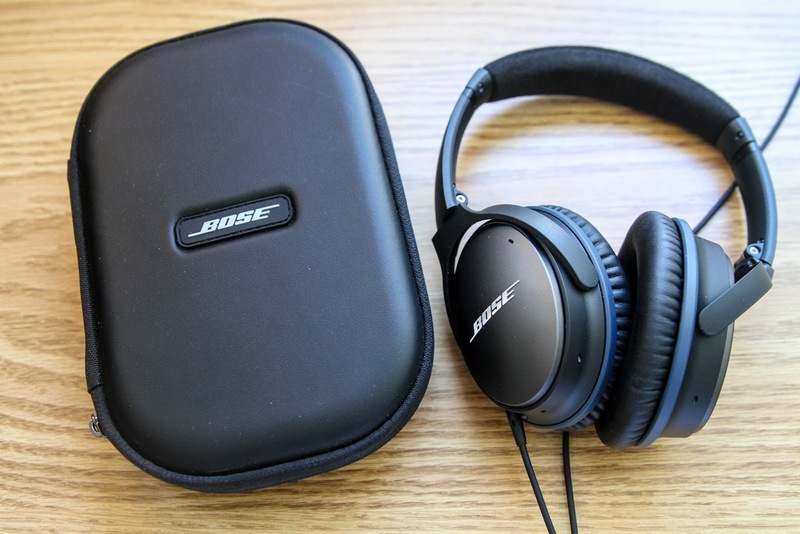 I really liked the Bose since the beginning but I wanted to go further in the search. The other option in the active cancelling was the Beats Studio Wireless. Both of them felt good. The Bose isolated much more but the Beats were wireless. Anyway, testing them in the shop was not enough for me. So the rest of the week I kept researching about them on the internet. The conclusions I found were: Beats had a worse isolation but better sound quality. Personally I found the bass too strong. Besides, they were more uncomfortable. And they were $80 more expensive. I still was confused about what to do, although I had more points for the Bose ones. So one week later I returned to Best Buy. I tried them on again, like 4-5 times each of them. I bought the Bose ones to try them in the library and finish with my uncertainty. If I wasn’t satisfied I could return them. I finally tested them in the true field: library. Passed with an A+. Done. 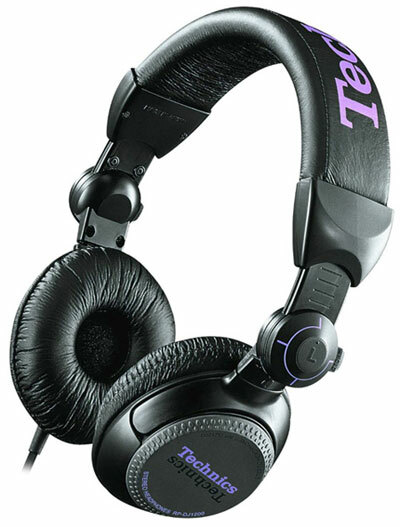 The main feature of the headphones is the active noise cancelling. What’s that? 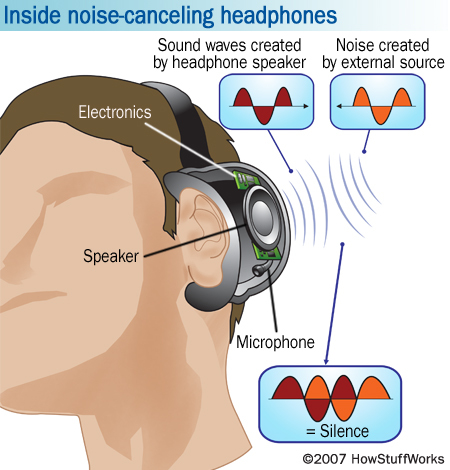 Well, basically the headphones listen the ambient noise and create the anti-sound. Technically talking, they create the same frequency wave, with the same amplitude but with a phase of 180º, which basically cancels the sound. This picture from electronics.howstuffworks.com represents quite well how it works. The headphones have a switch to turn on the system. 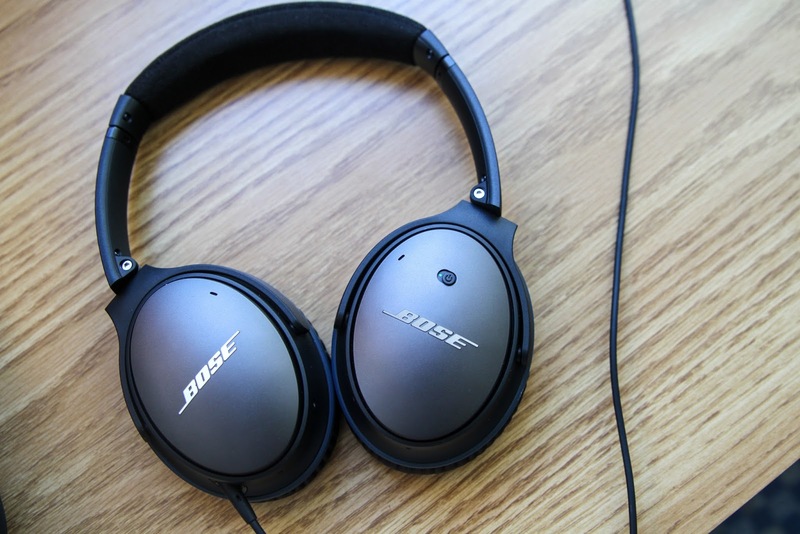 You can listen to music with the noise cancelling off but the sound quality is not the same. With the system on and no music you can hear a negligible sound created by the sound cancelling, in the background. Almost inappreciable. Besides, it needs a AAA battery to make it work. It lasts about 30 hours. I bought 4 batteries + charger for $15. Enough. So how much do they isolate? With the noise cancelling off I would say they attenuate around 15dB. Similar, maybe something less than passive noise cancelling headphones. When you turn them on all the background noise is gone. Yes. All. I asked some people to try them, to see their reaction. Priceless. One of the things I was really sceptic about was cancelling the voice of people. As it’s not constant it’s trickier to remove it. Well, it does a decent job. Actually a good job. It usually happens to me that I’m working with the minimum music volume, I remove the headphones and realize that there is a group next to me talking quite loud. It’s really impressive. Definitely they isolate more than the Howard Leight headphones. At any frequency. I have to confess that the reason it took me a while to decide for them was the sound quality. In the beginning I found it was absolutely average. I mean, worse than the Technics I used before. But it seems that when you change the headphones you need a while, to get used to them. Apparently the transition is the most normal thing. So I was patient and in the end I got used to them. Now they feel much better, although the quality could easily be improved. 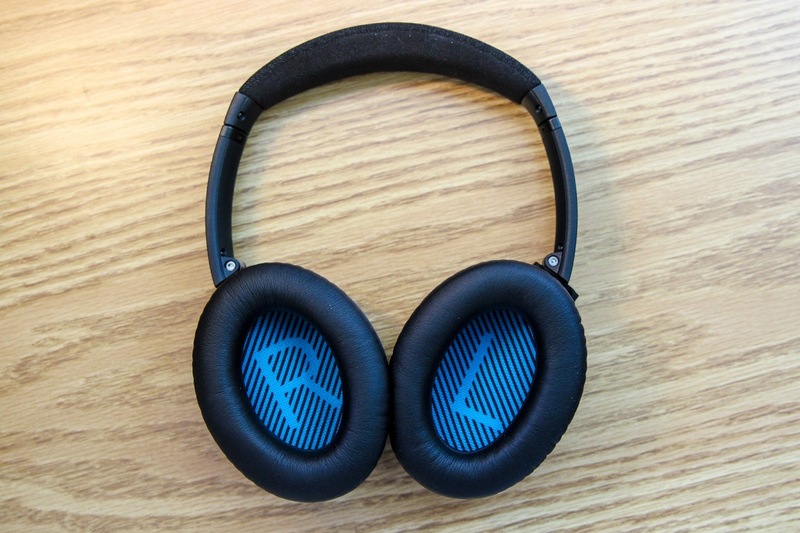 They’re the most comfortable headphones I’ve ever tried. Actually the first time I put them on I felt they were too light. The music cable is removable, which is a big advantage. The problem is that on the side of the headphones the jack is not 3,5mm. It’s 2,5mm so in case you have to buy it I guess it will be expensive. The cable has a microphone with 3 buttons, to skip the song etc. The headphones have a nice case to bring them. There is a compartment for a battery just in case you finish the one you are using. They’re expensive. Yes. But in my opinion they are a good investment. Comparing with the phone, for example: Nexus 5 = $450. Expected lifetime is 2 years. And I use it 1,5 hours a day. 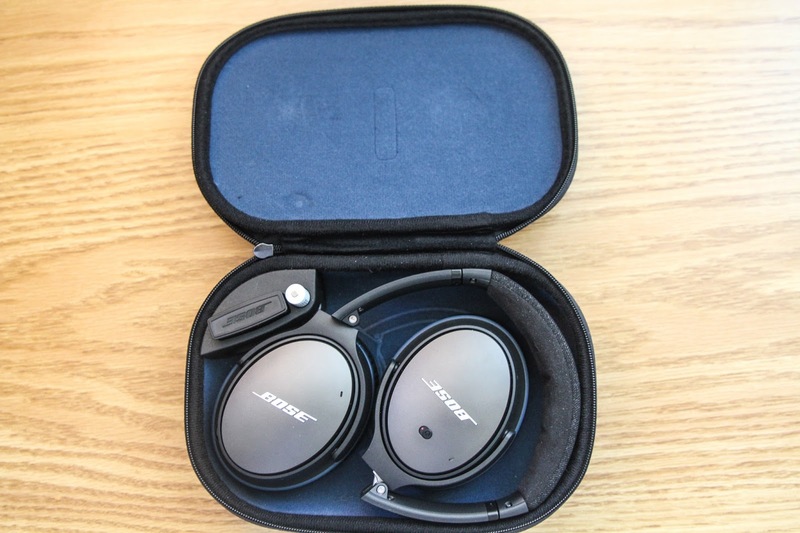 Bose QC25 = $330 (taxes included). Expected lifetime is 4-5 years (hopefully many more). Average use 5 hours a day. Many days up to 10 hours.